Frank Llewellyn ia prominent member of Democratic Socialists of America. In 1992 Frank Llewellyn was a member of the Democratic Socialists of America Racial Diversity Task Force - charged with finding ways of recruiting (and retaining) more "people of color" into the organization. In 1993 Frank Llewellyn was political action chair of the New York Democratic Socialists of America Steering Committee. In 1994, Llewellyn of Brooklyn, New York was a member of the Democratic Socialists of America Steering Committee. Llewellyn, of the New York City DSA, was elected to the Democratic Socialists of America National Political Committee, at the November 1997 DSA National Convention in Columbus Ohio. In 2001 Frank Llewellyn was Political Action Chair of New York City Democratic Socialists of America. 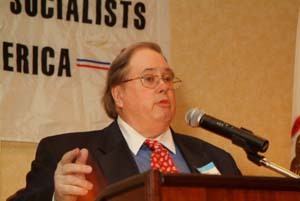 In 2002, Frank Llewellyn was appointed Democratic Socialists of America National Director for a term that will extend at least through January 31, 2003. Llewellyn had served as Acting Director since May 15th 2001. Frank Llewellyn was a founding member of one of DSA’s predecessor organization, Democratic Socialist Organizing Committee, and worked on its staff for nine years until 1981. He has served in the national leadership of DSA since its formation in several capacities and was a member of the National Political Committee for five years until he resigned to become Acting Director. DSA participated in the observer delegation from the Socialist International to the Mexican elections in early July 2006. DSA National Director Frank Llewellyn led the delegation, which included Skip Roberts (Washington, DC), Daniel Reynolds (Miami) and Michael Lettieri (Washington, DC). Michael Lettieri also represented the Council on Hemispheric Affairs (COHA). We participated in this delegation because of the extraordinary importance that political developments in Mexico hold for the United States and because of DSA's very close relationship with the PRD--the only significant party representing genuine social democratic change in Mexico. At the Meeting of the Council of the Socialist International, United Nations, New York, 21-22 June 2010, delegates included Puerto Rican Independence Party members Ruben Berrios Martinez and Fernando Martin Garcia and from Democratic Socialists of America, Frank Llewellyn, Joseph Schwartz, David Sasha Duhalde-Wine, George D. Roberts, Luis Alejandro Duhalde. Participants included representatives of the Socialist Party of Albania, MPLA (Angola), Bulgarian Socialist Party, Socialist Party of Chile, Sandinista National Liberation Front (Nicaragua), Mongolian People’s Revolutionary Party, Democratic Left Alliance (Poland), African National Congress (South Africa), Movement for Socialism (Venezuela) Observer parties included Polisario (Western Sahara) Consultative parties present included Fatah (Palestine), All-Nation Social Democratic Party (Kazakhstan). In 2008 Frank Llewelyn, National Director of Democratic Socialists of America, New York signed a statement circulated by the Partisan Defense Committee calling for the release of convicted “cop-killer” Mumia Abu-Jamal. Frances Moore Lappe, the author of several books, beginning in 1971 with Diet for a Small Planet. She helped launch the Institute for Food and Development Policy (Food First), and—in 2002—the Small Planet Institute, which promotes global democracy and environmentally sustainable development. U Decide 2008, a recent Institute project, targeted undecided voters with flyers comparing the records and positions of Obama and McCain on specific issues. She is also on the Advisory Board of the Union of Concerned Scientists, and was selected by the Women’s National Book Association as one of the 12 living “women whose words have changed the world". Tim Costello, is a longtime labor activist and former truck driver who helped organize the North American Alliance for Fair Employment, a network of 65 unions and community groups in the U.S. and Canada. He is currently on the Advisory Board of the UMass Boston Labor Resource Center, and is Co-Director of Global Labor Strategies (www.globallaborblog.org). Tim Costello is also co-author of "Global Village or Global Pillage: Economic Reconstruction from the Bottom Up". Frank Llewellyn, is the National Director of Democratic Socialists of America, and on the Board of NY Citizen Action. In 2009 Frank Llewellyn signed a petition calling on President Barack Obama to Renegotiate NAFTA. The petition was initiated and circulated by Democratic Socialists of America. Frank Llewellyn was a New York Democratic Socialists of America delegate to the DSA 2015 National Convention. Members of Queens Democratic Socialists of America unofficial closed Facebook group, August 2017 included Frank Llewellyn .